I thought worship was just music. I was thinking to myself I am a good worshipper, I dance, sing and worship ALL DAY! But that wasn’t what The Lord was and still if talking to me about. He is asking me the question, “What do you talk about day in and day out? What is your main focus on day in and day out?” Umm well that was different and hard. Now, I knew exactly what He was referring to the second I heard those questions. Now, it wasn’t condemning questions it was more of our good Dad helping me understand. I spent a couple days writing down all the things that I have talked about. It was easy because sure enough I talk about the same thing every flipping day. Arggggg I was so frustrated. I was annoyed with myself. This thing that I have been talking about for years is killing me. Literally killing me. Enough is enough right? I think about how many hours, how much emotional crap and how much the people I talk about it to are so so so over it!!! Louie Giglio defines worship as our response, both personal and corporate, to God for who He is, and what He has done; expressed in and by the things we say and the way we live. Read the “expressed in and by the things we say and the way we live”. So good right? I want to be a person of peace, love, compassion, mercy and hope for my family and others. When we spend our days worshipping other things that lead us into darkness we loose sight of what The Lord is doing and how He is working. When we spend our days talking about other people, our problems, ourselves, our husbands, our kids, someone who made you mad on the road, our family or whoever we miss Him. We miss His presence. Now I am guilty as all get out on this. I am learning and hopeful for my little girl heart can grasp more of Him and what He’s teaching me. Join me in learning to close out mouths of hate and gossip and open our heart to more of Him. It’s a hard season but I am willing to learn and ask for more. That’s all He asks for is open hands and following Him. 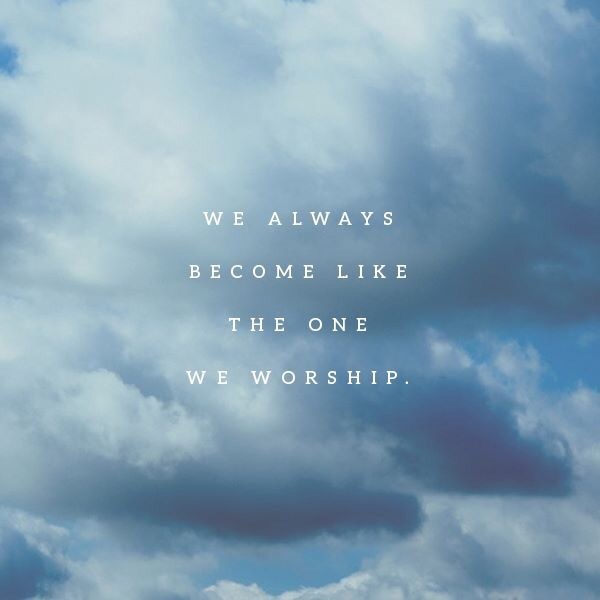 We always become like the one we worship. What do you worship? What does your day look like? What would the world look like if all we talked about was how amazing Jesus is and his stories? Now that’s worship.